There are now two stories that are developing that are competing for my attention. 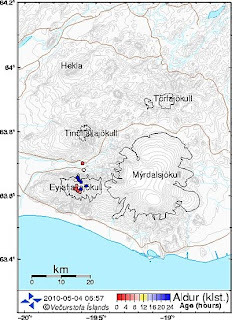 Given that I am hoping to be flying on Thursday, the increase in activity at Eyjafjallajokull in Iceland, is of concern and there is more information available on what is going on in the Gulf of Mexico. As a result the ash cloud has grown and flights from Ireland and now Scotland have been grounded. It now depends on the wind directions as to what additional impact this increase in activity might have. UPDATE: Despite some continuing earthquakes at the site, the ash cloud is now considered no longer a threat, and flights will resume after lunch. One can therefore turn attention back to the Gulf situation, where the first major attempt to reduce the leak is underway as the first dome, built to capture the oil from the major leak, leaves Port Fourchon. This, the first of the three systems that BP hope will be able to cap the leaking riser has been build and will be shipped out today. There are three points at which the riser is leaking oil. The main leak is some 600 ft from the well head apparently. Part of the concern as to how well it will work, even if it does get put in place by the end of the week, lies with the relatively soft seabed at the point where the cap will be placed. The system is made up of a 125-ton, 14’ x 24’ x 40’ structure that will be set on top of the largest leak source. This leak is located at the end of the riser, about 600 feet from the wellhead. 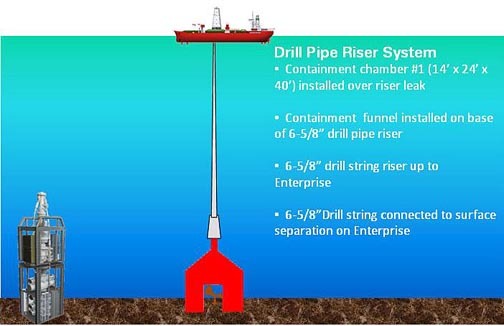 • Equipment at the top of the system is connected to a 5,000 foot riser that will convey the hydrocarbons to the surface ship, the Deepwater Enterprise. • Once in place, oil will flow up into the containment system’s dome to the surface ship. • Once on the surface ship, the hydrocarbons will be processed and oil will be separated from water and gas. The oil will then be temporarily stored before being offloaded and shipped to a designated oil terminal onshore. 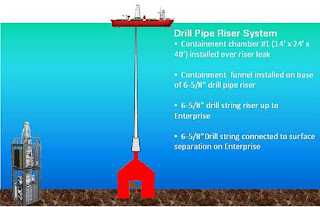 • The Deepwater Enterprise is capable of processing 15,000 barrels of oil per day and storing 139,000 barrels. • A support barge will also be deployed with a capacity to store 137,000 barrels of oil. • This system could collect as much as 85% of oil rising from the seafloor. While the impact of the spill has not stopped other companies who are drilling in the Gulf. it has caused the Governor of California to shelve plans for off-shore drilling in California, for the present. The report from a fisherman who was fishing near the rig at the time of the explosion states that the rig first vented water, and then natural gas, and that after the lights on the rig went out, the explosion came possibly as the emergency power generator kicked in. The ACS system is a redundant receiver/transmitter for communication with the rig through acoustics. 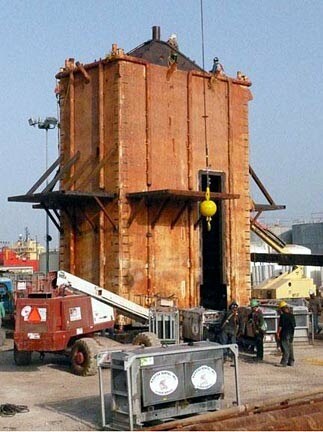 It is interfaced to the BOP control pod so that different sets of emergency functions can be executed to shut down the well and avoid a pollution. If the regular umbilical is broken and normal communication with the BOP is not possible, the ACS is the last and only means to shut down the well. If a function is executed from the ACS, signal goes to a solenoid that activates a big valve on the BOP; the valve is then energized by air pressure bottles on the BOP. In this case that doesn’t seem to be likely to have helped, since there was, apparently, a signal on the rig floor that the BOP had activated, though obviously it had not worked the way it was intended. The reason(s) for the BOP failing to work as anticipated is still a matter of conjecture. UPDATE: There does now appear to be some conjecture as to whether the BOP was, in fact, activated before the rig lost power, and thus whether it was the damage that the BOP then took, which stopped them from working, rather than the alternative which has also been suggested, that the system was not powerful enough to shear through the sections of pipe within it at the time of the failure. However there still remains the question as to how the oil and natural gas managed to penetrate into the well after the production casing was cemented into position. Haliburton issued a statement noting that the cementing of the string was completed 20 hours before the incident, and that the integrity of the casing (I presume including cement) had been completed. There are thus now a multiplicity of folk that are being considered potentially to have some part of the blame for the incident. 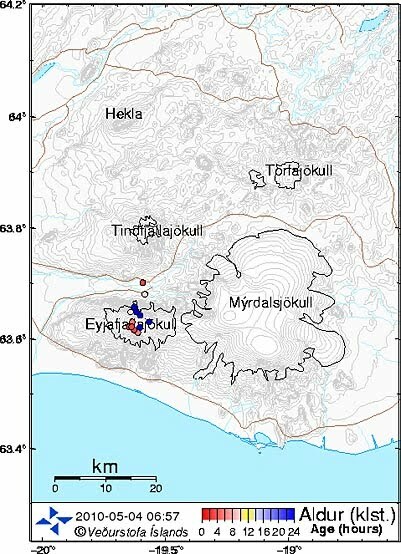 With both the Icelandic volcano and the oil flow in the Gulf, we are in a period of waiting for what will happen next. Given that I will, volcano permitting, be flying back to the States later in the week, and am starting that journey, posting may be a bit shorter for the next couple of days.